A landlocked district, Idukki is one of the most nature rich areas of Kerala. Three main rivers – Periyar, Thalayar and Thodupuzhayar – and their tributaries, gird the high ranges and wooded valleys. The river Pamba also has its origin here. As a tourist destination, Idukki offers diverse attractions like wildlife sanctuaries, hill stations, spice plantation tours, mountain treks, elephant rides etc. Vagamon: 65 km from Idukki town. Situated at an elevation of 1100 m above sea level, this hill station is a trekker’s delight. 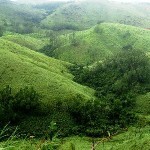 Beautiful meadows, valleys and tea gardens surround Vagamon. 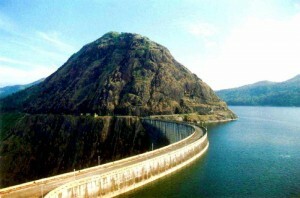 This entry was posted in Idukki, Kerala and tagged Idukki Arch Dam, idukki dam, idukki district, idukki india, idukki map, idukki maps, idukki tourism, idukki tourist places, Vagamon. Bookmark the permalink.